If you’re driving from NYC toward the Hamptons and pass through Riverhead and Flanders, chances are you’ll notice a curious roadside attraction along the way. 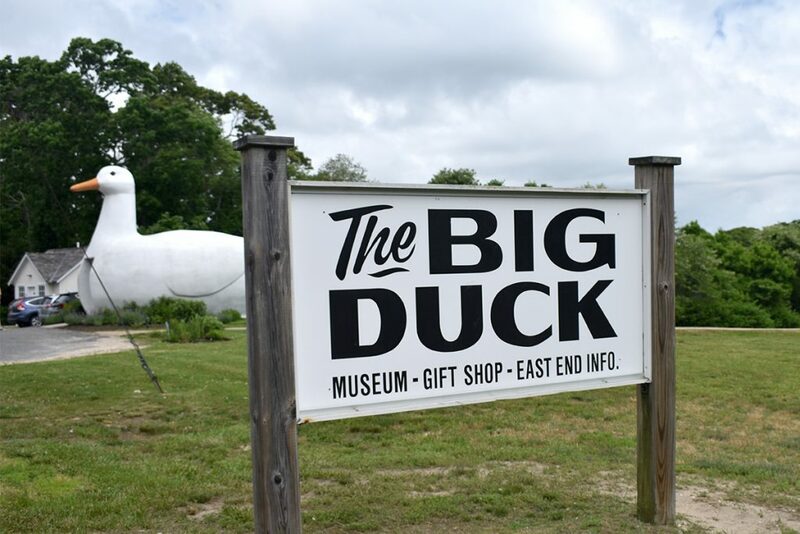 Towering over Route 24 in quiet Flanders is an iconic local landmark: a giant statue of a waterfowl well known as the Big Duck. It’s a sign for the travel-weary that their Hamptons destination is not much farther — and also a historic and vital piece of American architecture. 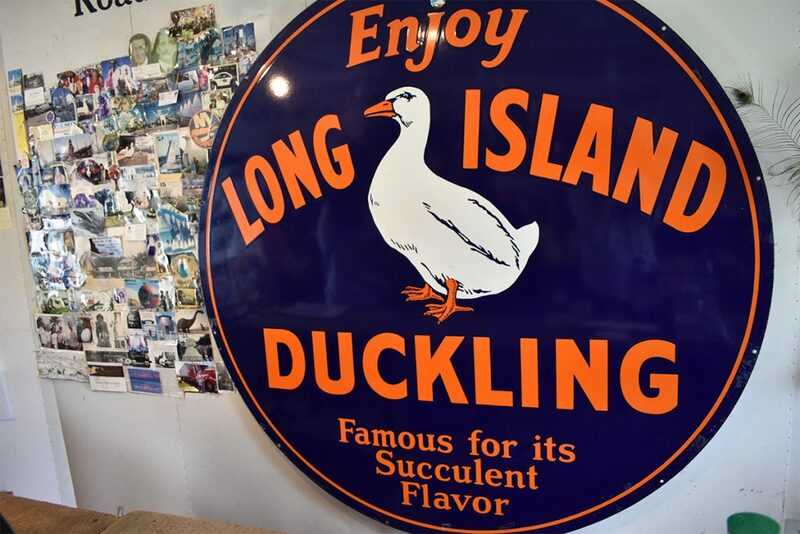 The history of the Big Duck loosely tracks the rise and fall of the duck farming industry on Long Island. From the 1920s through the 1950s, duck farming was an important local part of local agriculture. According to a 2009 Suffolk County agricultural report, more than 75 percent of all ducks produced in the U.S. came from Long Island. By the 1960s, Long Island produced more than 7.5 million ducks per year. While on vacation in California one year, the Riverhead duck farmer Martin Maurer stopped at a coffee shop shaped like a huge coffee pot. Fascinated, Maurer became convinced that passersby would not be able to resist stopping at a retail shop for his duck farm if the shop itself were shaped like an enormous duck. In 1931, Maurer set out to build such a “Big Duck.” He engaged a couple Broadway set designers and some local artisans to construct a 20-foot-tall, 30-foot-long building using concrete (technically, “ferrocement”) over a wooden frame. Tail lights from a Ford Model T were used for the duck’s eyes, and voila, the store was complete. In 1937, Maurer moved his farm and shop — by then trademarked and known as “Big Duck Ranch” — from a location off of Route 25 in Riverhead to one near Route 24 in Flanders. There the Big Duck remained until 1988. By that time, though, the Long Island duck farming industry had contracted almost to the point of closure. 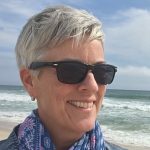 Some duck farming practices were blamed for creating runoff detrimental to adjacent Long Island waterways. Beginning in the 1970s, the New York State Department of Environmental Conservation set much stricter regulations on land use, causing many of the Long Island duck farms to close or relocate. Booming real estate prices forced some farmers to sell, and increased real estate development pitted duck farmers against developers and homeowners who loathed the pervasive stench of the duck farms. As a premier example of 1930s roadside architecture, the Big Duck had become more than a relic of a defunct industry and a local curiosity. The Big Duck gave rise to the architectural term “duck” — meaning a building whose shape expresses the business housed within. In 1987, real estate developers planning to demolish the Big Duck met fierce opposition. Local activists and Big Duck lovers from all over joined Suffolk County in campaigning against its demise. 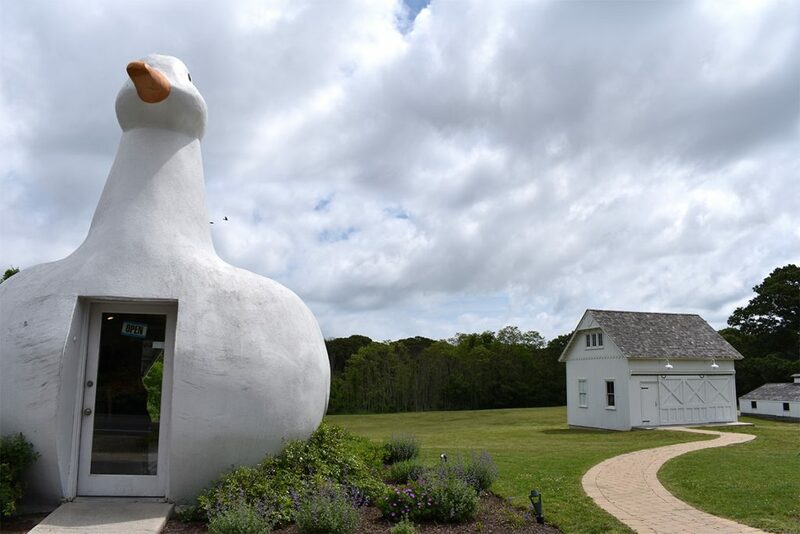 Ultimately, the developers gifted the Big Duck to Suffolk County in 1988, and the county soon moved it to the entrance of Sears Bellows County Park in Hampton Bays. In 1997, the Big Duck was named to the National Register of Historic Places, and in 2007, it returned to the site of the former Big Duck Ranch in Flanders, where it sits today, presiding over a public park. 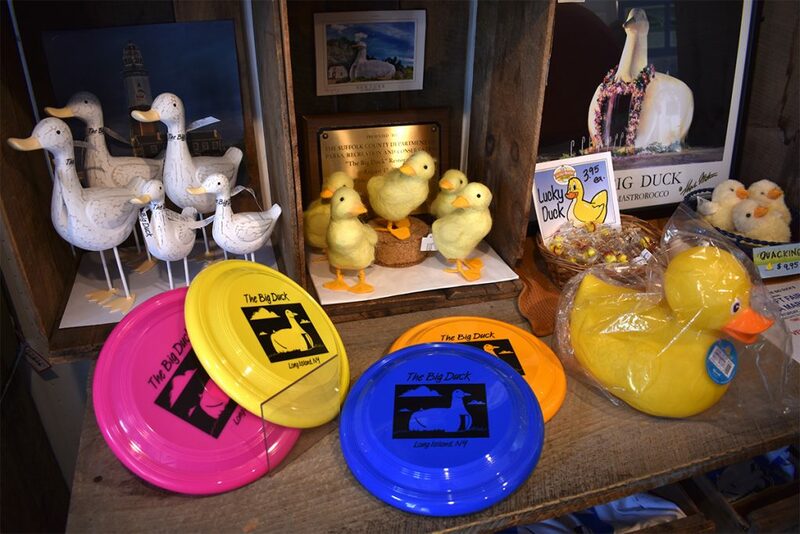 Visitors should stop by and look inside — Friends of the Big Duck operate the place as a museum and gift shop for “duckabilia,” and keep it open most days year-round. If you’re in the neighborhood just after Thanksgiving, you’ll find the Big Duck all decked out for the holidays.